Hey friends!! I hope your Thanksgiving was wonderful! I would like to say that as I sit and write this post that I'm thankful for the holiday of holidays to give gratitude for an excuse to eat pie. After all, Thanksgiving is a holiday known for having pie for dessert, right? Seeing as how I'm immensly grateful for many wonderful blessings in my life and that it would be the gracious thing to do--to be grateful for all the pie, I fear I am guilty of eating WAY TOO MUCH. To the point of feeling like right now I've just recovered from a sugar coma. Several hours later. Is there such thing? Yep. Couldn't resist. I just had to try a "sliver" of each kind. So now I'm not feeling so grateful for pie. Even though it is my favorite food. My family and anyone that has come to our traditional Thanksgiving evening pie get togethers, will tell you that I go all out when it comes to this event and I make several different types of pie. It's crazy, and now I'm paying the price with regret. 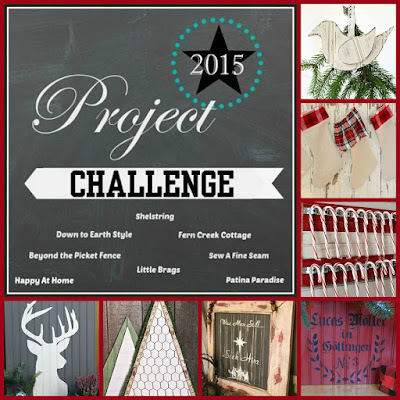 I am happy, however, to share my Project Challenge #11 using Bead Board with you today, along with my project challenge buddies! I Love this time of the month! Bead board is my favorite decorative material. It is classy, sweet, and stylish all wrapped into one. It's like chalkboard paint, the answer to a decorator dilemma. Don't you think? And as you can see, there are many wonderful ideas we have for you, so don't forget to check them out at the end. I will tell you that I entertained the possibility of a miriad of projects for this one, but seeing as I just finished the amazing task of giving the family room an overhaul, the thought of starting another big project, in the midst of the holidays and getting ready for Christmas in my shop space, was just too much. So I decided to do something way different than I've ever done before and made it into a piece of art. This was a vision I had in my mind, but was one of those things that I had to just roll with as I went along. There are a few things I would do differently, one would be to resit sanding down the art itself. Looking at pictures, I like the way it looked before. I just can't seem to fight the urge to sand EVERYTHING for Pete's sake! But overall it was a neat process and with each project comes a little more experience and learning. right? I am enjoying the string of wooden beads I made during a family scripture study. I used this quote on a Christmas card I made years ago. 75 reproductions to be exact. I tried to find it to show you,but I have no idea where it is in all the stuff in my craft closet. Maybe another time. But it was my favorite of all and I always think of this quote, every Christmas and throughout the year. Aren't you excited to get moving on Christmas decorating? What have you done to start? I always procrastinate the Christmas cards. We're finally getting our pictures taken today. Quite a task with such a large family. Meanwhile, enjoy the projects my awesome friends have to share with you too!! 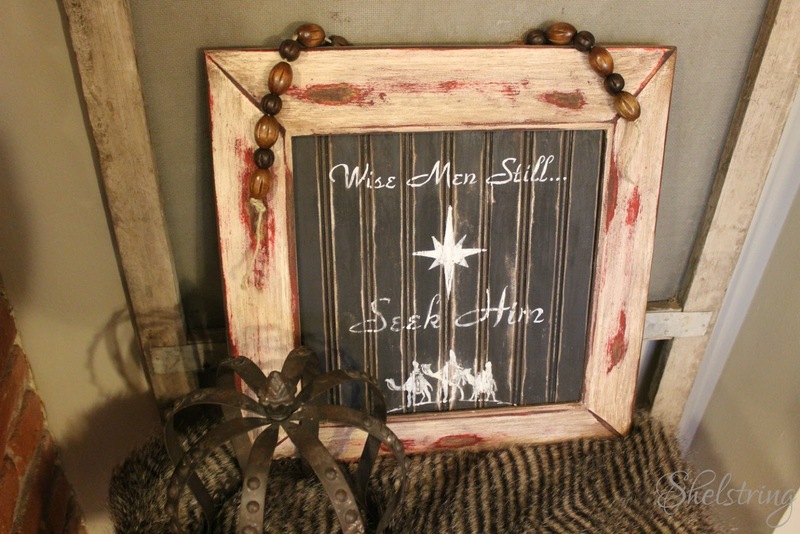 One of my favorite Christmas sayings, so sweet on the beadboard in this little frame. 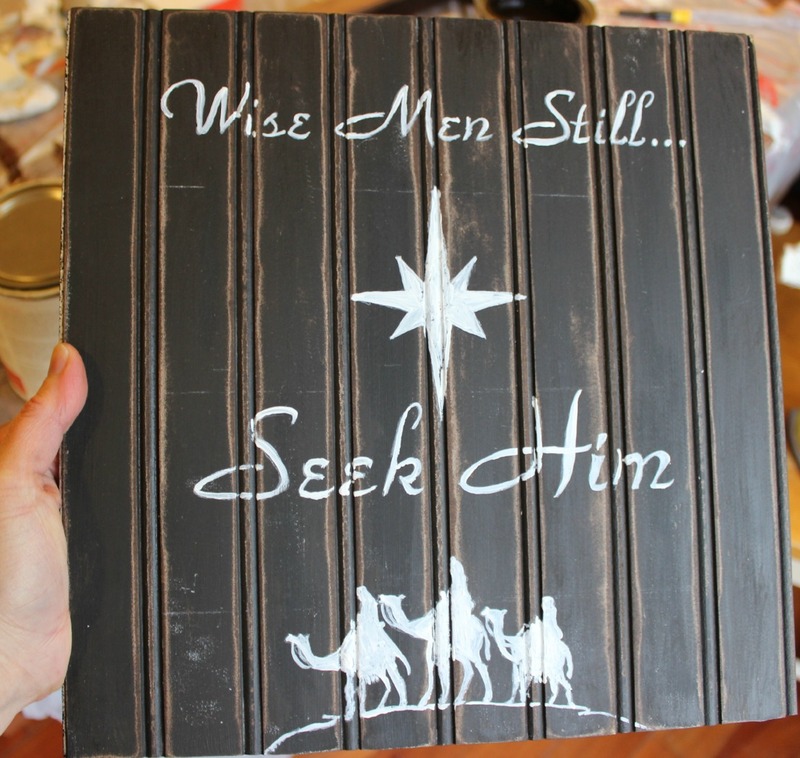 Hi Michele, I love the image with the wise men and the camels, so wonderful. Merry Christmas!!!! 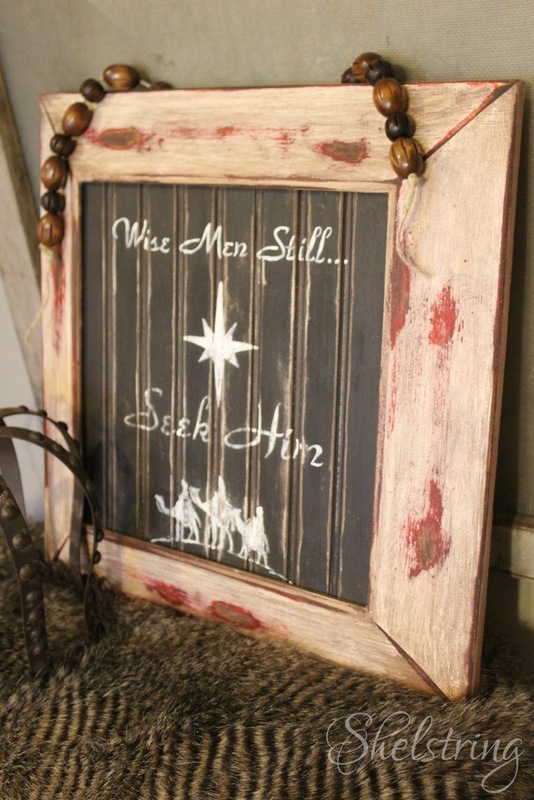 Super idea to frame it too!!! Thank you Christine, Merry Christmas to you and thank you for visiting my blog...love your project too! Love it Michele! So pretty - and I like everything sanded a bit to give it texture and a shabby chic look! I have the same problem with knowing when to stop sanding. :o) But I think your project turned out beautiful! I need to make one for Christmas. Thanks for the inspiration! I just love your project so much! 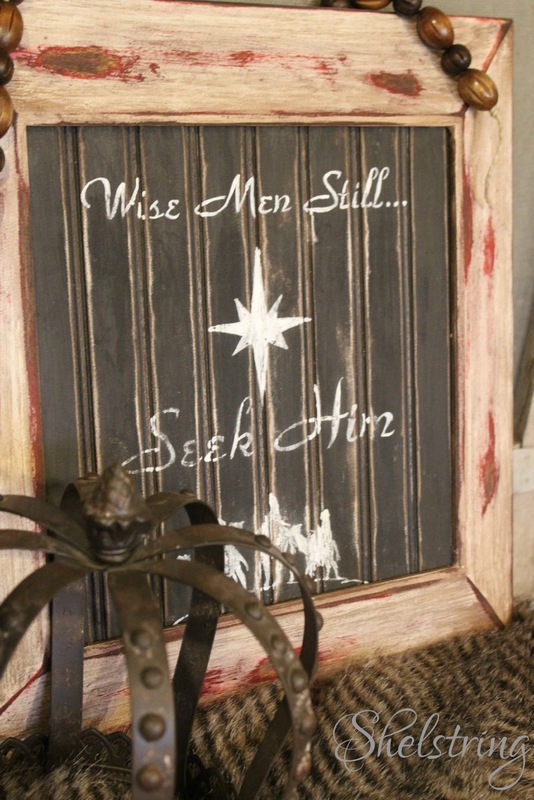 It looks great and is such a great reminder of what Christmas is all about! Love the paint treatment you used too! I love this!! I have never thought to use bead board this way, it looks so good! 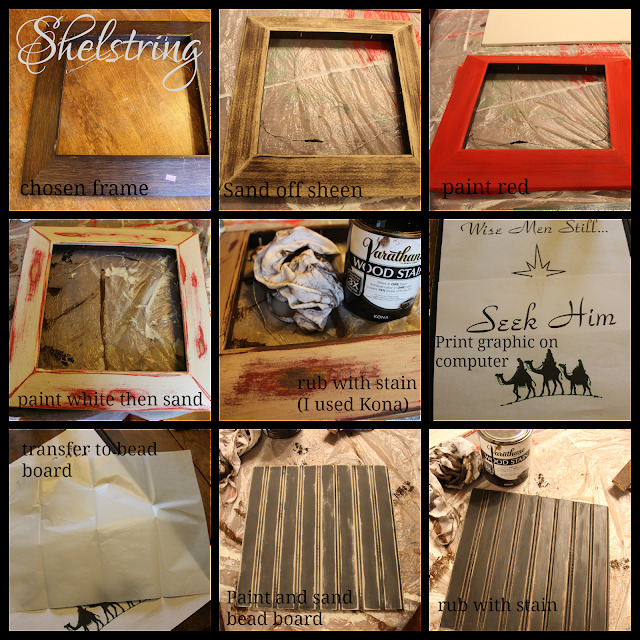 And what a great way to fill a frame that you don't have glass for! 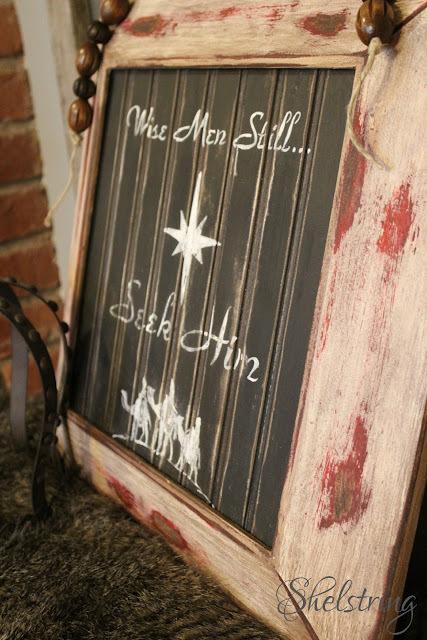 And I love the sentiment, especially this time of year! I am full on decorating, pretty much done really...just adding finishing touches here and there. The big snow storm we had last week got me rolling early! I procrastinate on my card too, I always have grandiose plans to write personal notes or letters in each card and leave it way to late every year it seems! 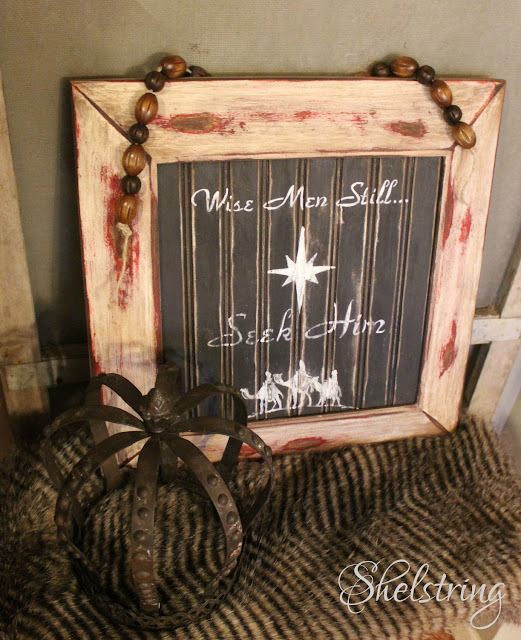 I love bead board and I love how you transformed it into a frame. Great idea!